Full Frame: IMDEX 2015 : Singapore Navy's Type 218SG Submarine Unveiled! IMDEX 2015 : Singapore Navy's Type 218SG Submarine Unveiled! 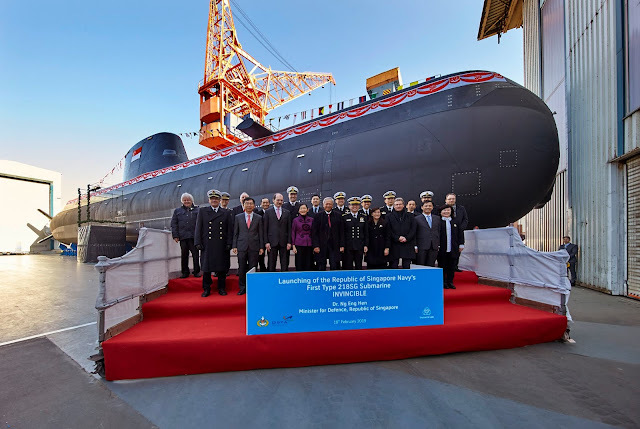 The Republic of Singapore Navy's ( RSN ) newest submarine on order, the Type 218SG, designed and built by Howaldtswerke-Deutsche Werft GmBH (HDW), subsidiary of the German shipbuilding conglomerate ThyssenKrupp Marine Systems GmBH ( TKMS ), was finally unveiled at the recently concluded IMDEX Asia 2015 in Singapore. IMDEX ( International Maritime Defence Exhibition ) is a maritime defence exhibition for trade professionals and is not open to the public. It is held once every two years at the Changi Exhibition Centre in Singapore showcasing mostly naval related stuff including ordnance, vessels and ship systems, coupled with conferences on maritime safety and co-operation, technology seminars, high-level networking events and naval war-gaming. The biennial IMDEX was first organized in 1997 and this year marks its 10th edition. 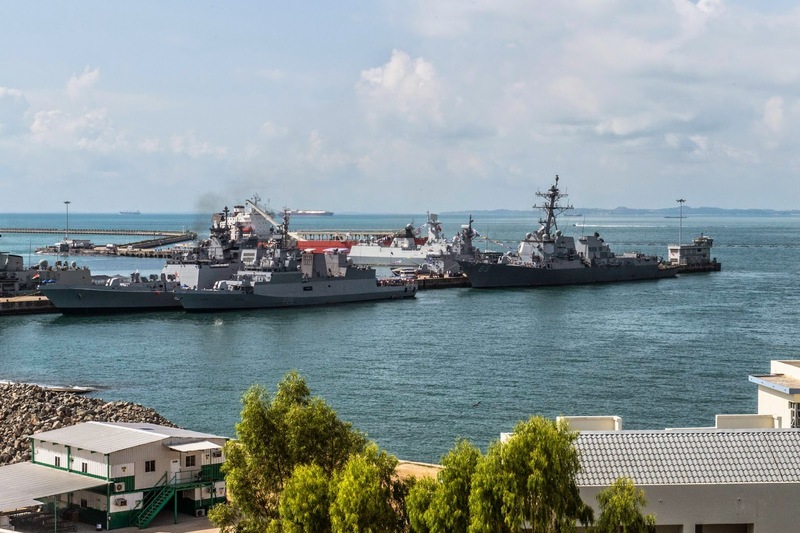 It is touted by its organisers as " Asia Pacific's only dedicated maritime defence event, serving the world's second largest naval market and beyond ". 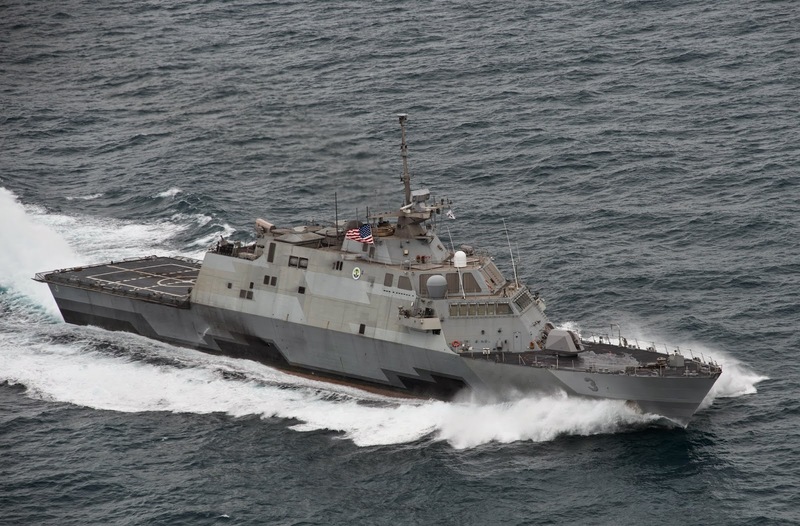 Statistics from IMDEX 2013 showed that there were 9337 trade visitors from 61 different countries, including 21 chiefs of navy and coast guard from around the world. 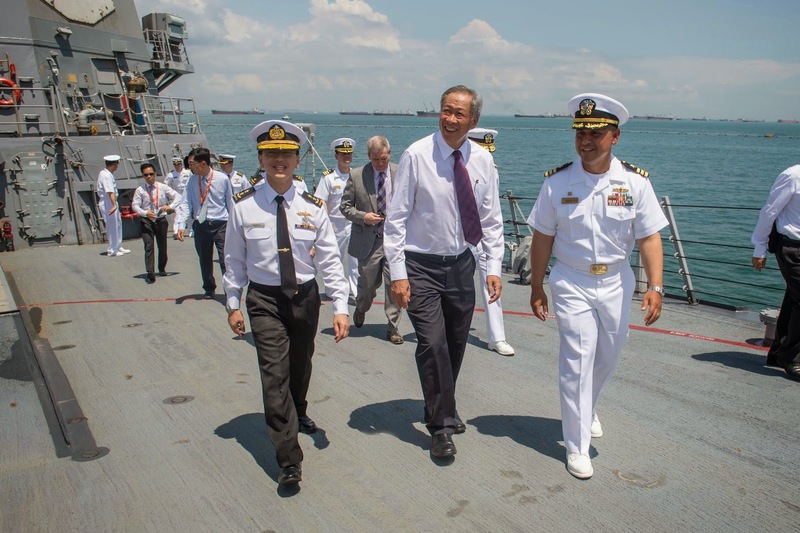 194 companies from 29 countries participated in the show as exhibitors and 15 warships from 9 countries also came visiting Singapore and were part of the other highlight of every IMDEX - the warship display held separately at RSN's Changi Naval Base ( CNB ). All eyes must have been on the ThyssenKrupp Marine System's exhibition booth because this is probably the first time since the official announcement of the submarine deal by MINDEF in Dec 2013 that a scale model of the Type 218SG were to be put on public display. 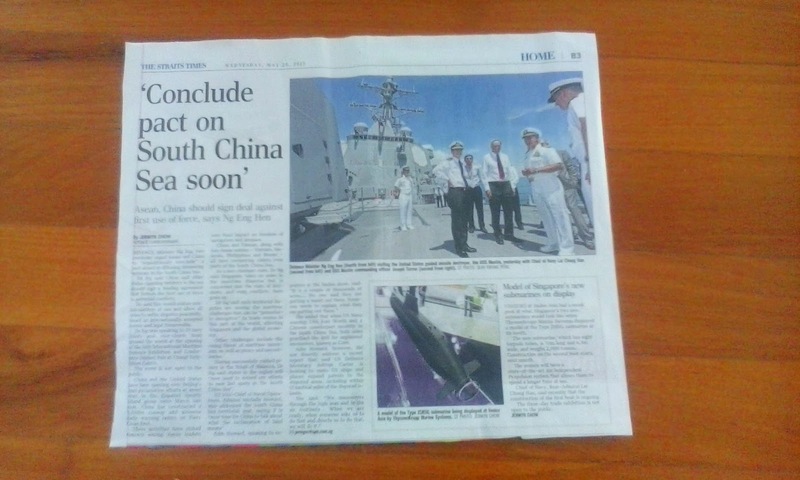 The report from the local newspaper The Straits Times on 20th May 2015 carried with it a not so great rear view image of the submarine model on display. 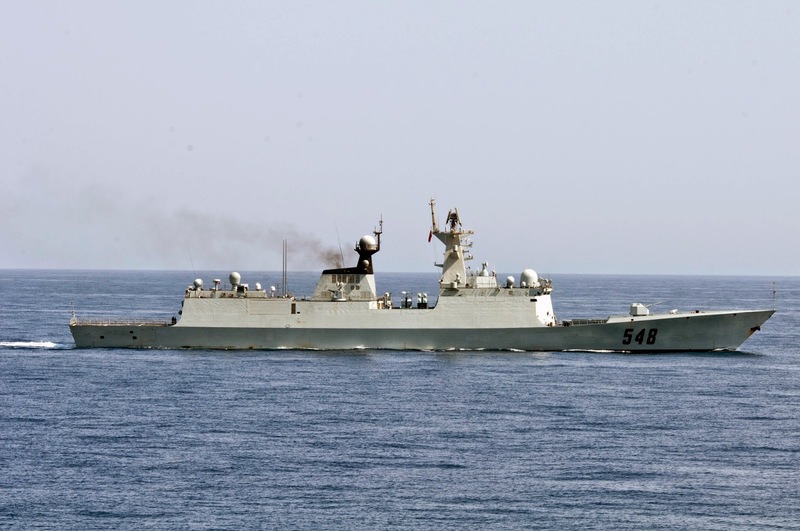 RSN's Chief of Navy Rear Admiral Lai Chung Han revealed that the Type 218SG would have a displacement of 2000 tonnes with a length of 70m and a width of 6.3m. It would have a total of 8 torpedo tubes. That would be two more than the Type 212 which has six tubes. 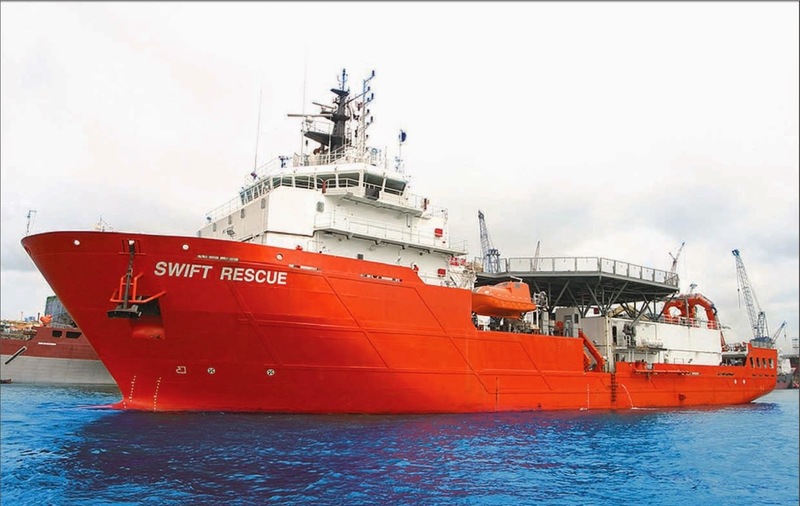 However there was no mention of whether the eight tubes are all forward facing or if some might be facing aft. 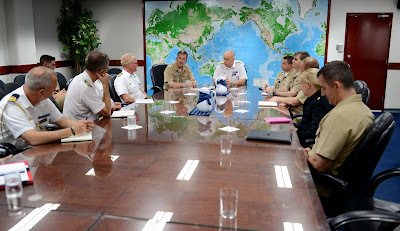 As expected of a non-military publication, don't ask if that 2000 tonnes refer to surfaced or submerged displacement. RADM Lai also disclosed that the construction of the first boat is ongoing and that construction of the second boat starts next month. Unfortunately that was all that was made public by the news article. So my previous estimate of 2500 to 3000 tonnes was a little off. But 2000 tonnes for a conventional diesel-electric submarine, albeit with air-independent propulsion, is still considered a very good size. 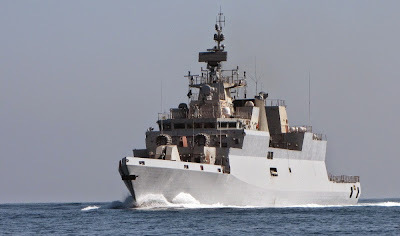 Bear in mind that the Type 212s and 214s only weigh in at about 1800 tonnes. 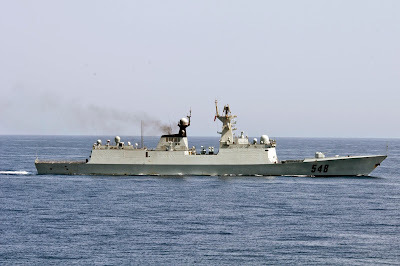 RSN probably took into consideration the congested nature of the home waters and the relative shallowness of the South China Sea, its most likely area of operations, and decided on that tonnage. In time to come, the Type 218SG would no doubt be deployed further afield, like to Guam or Oahu for the RIMPAC exercises, and that increased tonnage and therefore increased range and endurance would definitely come in handy. 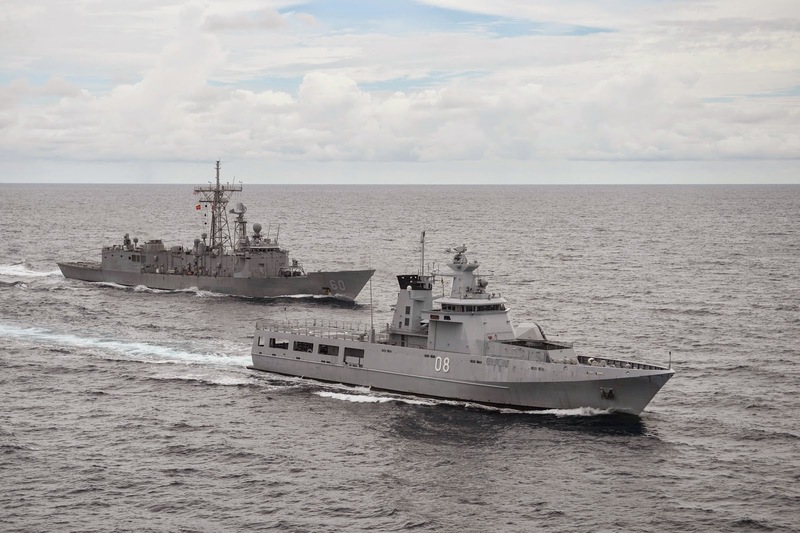 This year's IMDEX Warship Display at CNB had 20 foreign warships from 13 countries. It goes without saying that RSN, being the host country, would also have put its naval assets on display, like the indigenously designed and constructed Endurance class Landing Platform Dock and the MV Shift Rescue Submarine Support and Rescue Vessel. 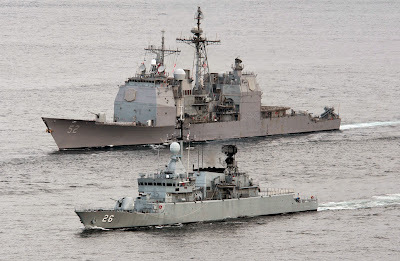 The warships from other countries include the USN's Freedom class Littoral Combat Ship USS Fort Worth (LCS-3) and the Arleigh Burke class guided missile destroyer USS Mustin (DDG-89), Royal Australian Navy's ANZAC class frigate HMAS Perth (FFH-157), Royal Brunei Navy's Darussalam Class Patrol Vessel KDB Daruttaqwa (PV-09), the Indian Navy's Kamorta class frigate INS Kamorta (P-28), Royal Malaysian Navy's Kasturi class corvette KD Lekir (FF-26 ), the People's Liberation Army Navy's Jiangkai II class ( Type 054A ) guided missile frigate CNS Yulin (FFG-569), Indonesia's Bung Tomo class corvette KRI John Lie and ships from South Korea, Thailand, Sri Lanka etc. 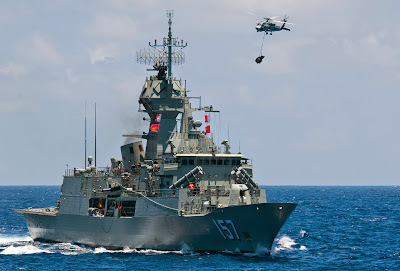 A S-70B Sea Hawk helicopter approaches the Royal Australian Navy Anzac-class frigate HMAS Perth (FFH 157) while conducting a vertical replenishment with the Military Sealift Command fleet replenishment oiler USNS Yukon (T-AO 202) in the Pacific Ocean during Rim of the Pacific (RIMPAC) 2012. US Navy Photo. 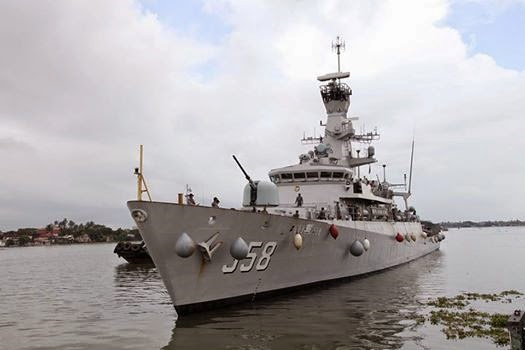 Note that the sister ship of the KRI John Lie, the KRI Usman-Harun had been banned from entering Singapore waters as it was named after two Indonesian terrorists who carried out the bombing of a commercial building in Singapore back in 1965 resulting in three civilian deaths and numerous injured. I believe the entire Bung Tomo class should be banned from Singapore as just the sight of one of them would remind Singaporeans of the other two, including the ship named after the terrorists. They all look similar and honestly I cannot tell the difference between the ships if not for the pennant numbers displayed. It is funny Big Brother had nothing better than a 15 year old pre-owned corvette to send for display at a premier naval exhibition. 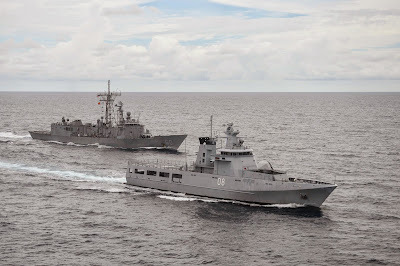 Maybe the rest of the TNI-AL fleet is too busy blowing up illegal fishing vessels to attend IMDEX. What a shame. Try harder next time, Dodo Boy. Some of the warships would conclude the IMDEX 2015 by participating in 5th Western Pacific Naval Symposium Multi-lateral Sea Exercise (WMSX). 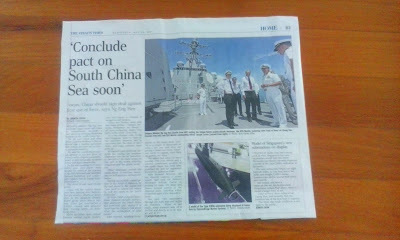 I certainly hope we would not have to wait two years before more information on the Type 218SG would be revealed. For additional information you can read my earlier post " Singapore Navy's New Submarines - HDW Type 218SG ".